The 700DTA is a compact active antenna specifically designed to provide good reception when large external antennas are not practical or when away from the main monitoring location. 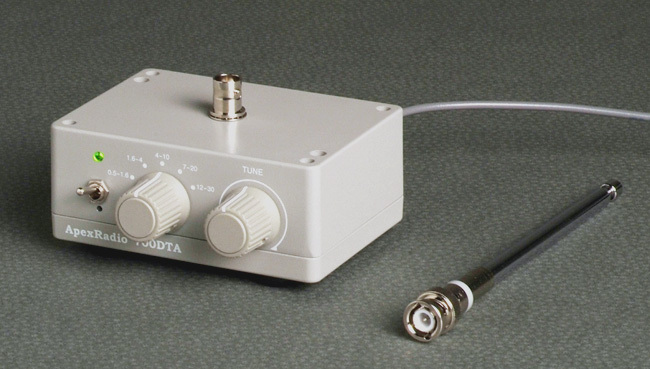 Compact, but achieving high performance, featuring an internal band selector, Hi-Q manual tuning circuit, and high gain amplifier(20dB for 500kHz-30MHz). And also excellent overall strong signal handling. The housing of 700DTA is an aluminum high pressure die-casting case with superior electromagnetic shield performance. The 700DTA is completely battery drive equipment separated from noisy AC power line. 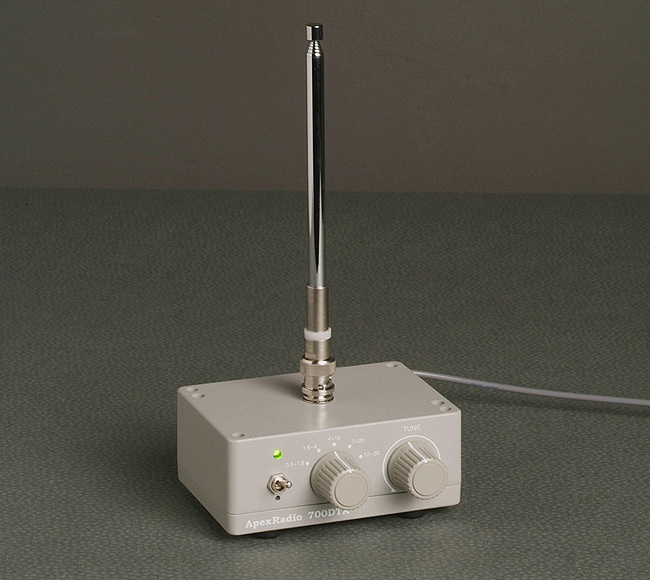 Then, 700DTA can be used as a portable receiving antenna. The 700DTA is NOT intended for transmit purposes. To turn on the 700DTA, throw the lever of power switch to upper position. Power indicator (green LED) will illuminate to confirm that power is supplied from internal battery. To turn off the 700DTA, throw the lever to lower position. Always turn off by lever when not in use. Turn on the radio receiver and tune to the desired frequency. 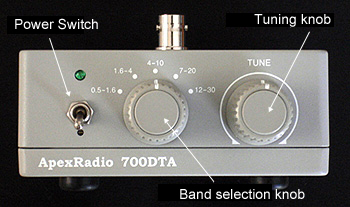 Select the correct frequency range with Band selection knob on front of 700DTA. Rotate the Tuning knob on the front side of 700DTA (clockwise and counterclockwise) until the signal strength meter (S-meter) of receiver deflects to maximum and the incoming signal sounds clearest. If your receiver does not have an S-meter, simply adjust for maximum received signal. Whenever receiving frequency is changed, should select band and tuning again.